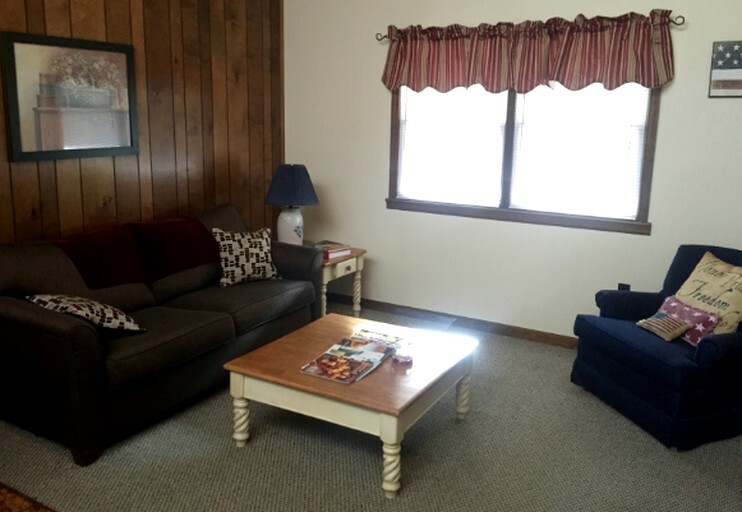 This cabin rental near Richmond, Virginia, features a living area with a full-size pull-out sofa, reclining chair and rocker, as well as a Television and DVD player for when the weather doesn't cooperate. 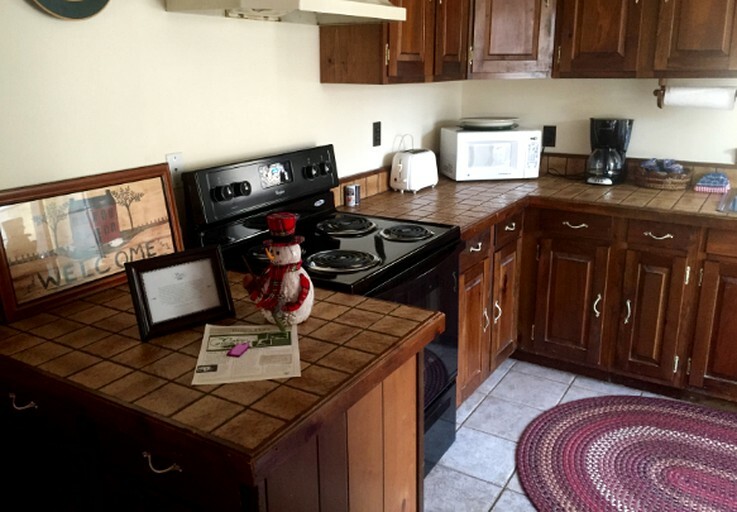 The kitchen is fully equipped with a full size refrigerator, gas stove and oven, a microwave oven, and a double sink. Pots, pans, and tableware are provided. There is a dining room table and chairs for dining all together. 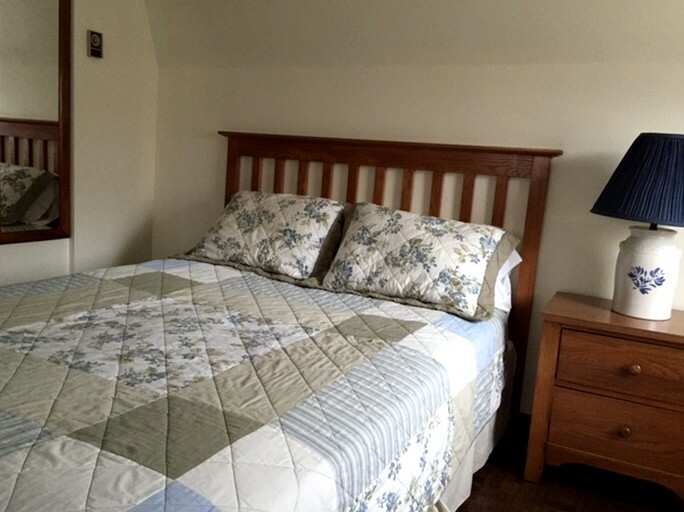 The upstairs bedroom features a queen bed, nightstand with lamp, a chest of drawers, and a loveseat. 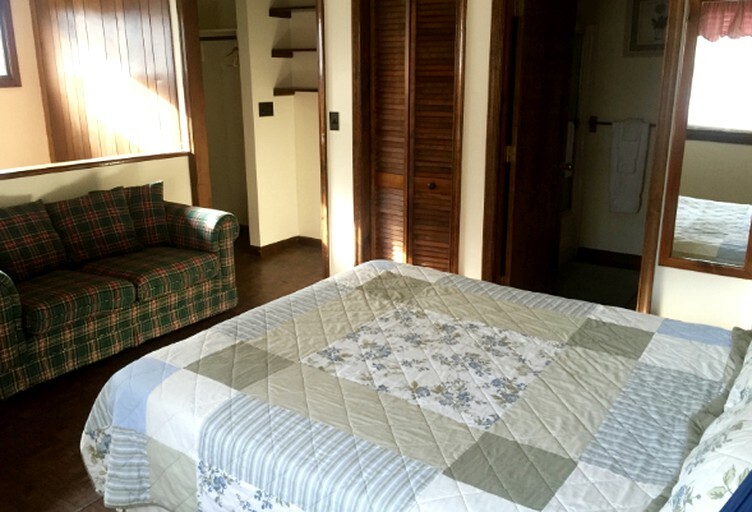 All linens, blankets and pillows are provided. 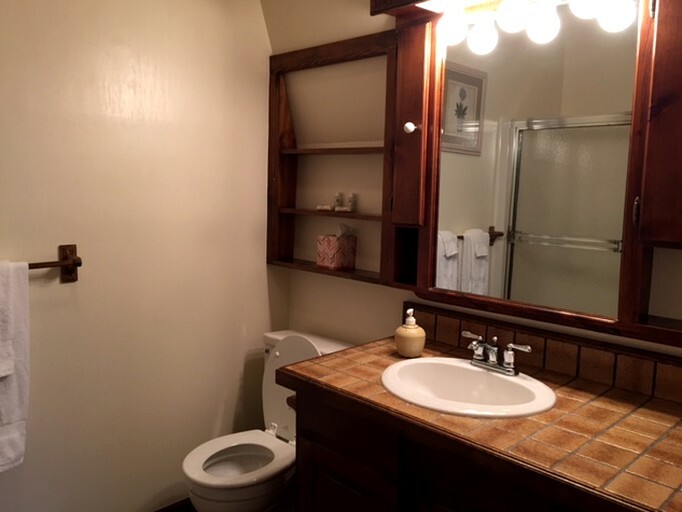 Off the bedroom is a private bathroom with a shower and bathtub combination, and vanity. 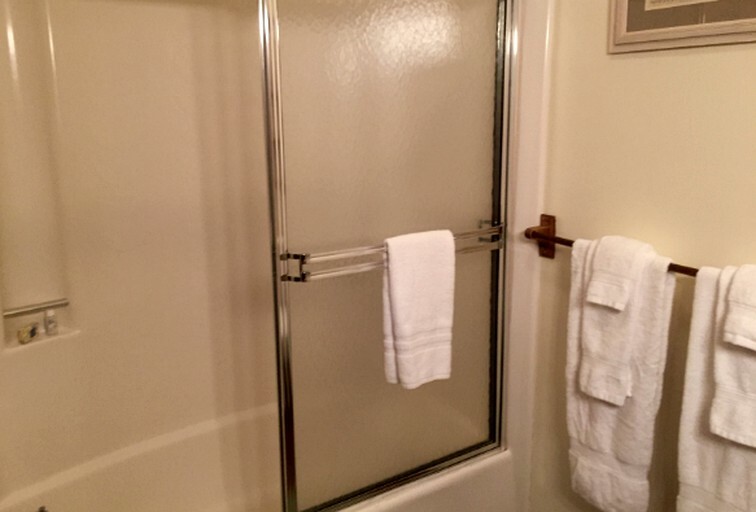 All guest towels are provided. Downstairs there is a washer and dryer available for guests' use. 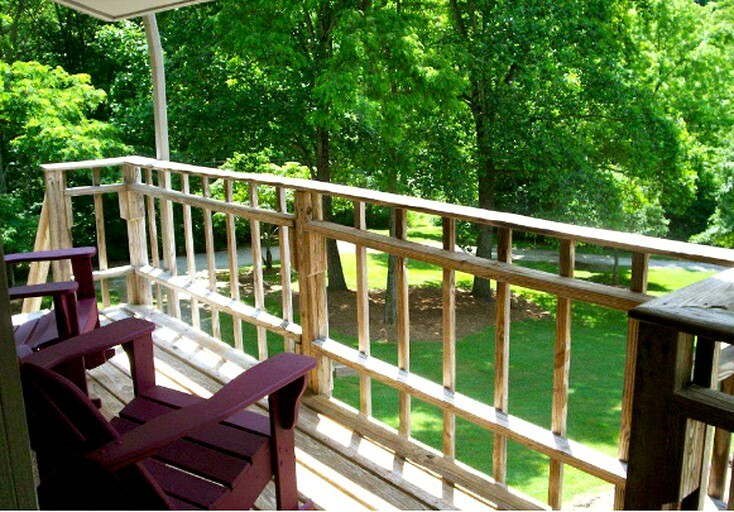 The front porch features Adirondack deck furniture and a wonderful view of the mountains. 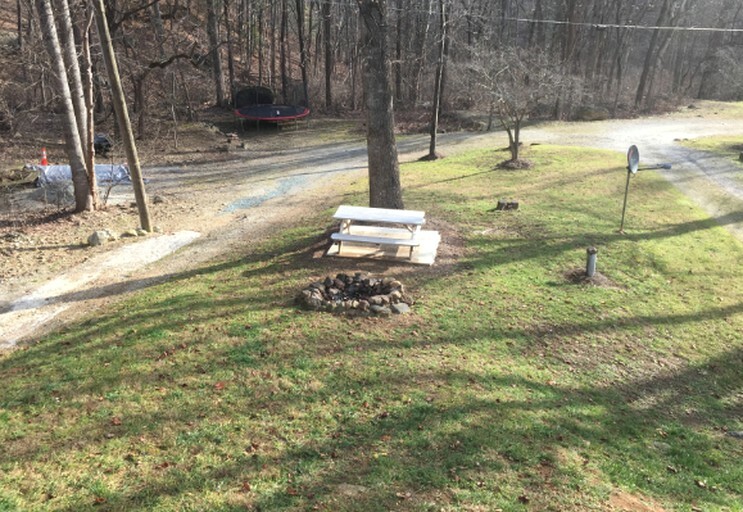 Off to the side, there is a stone fireplace and a picnic table provided for alfresco dining, as well as a barbecue grill and cooking utensils. 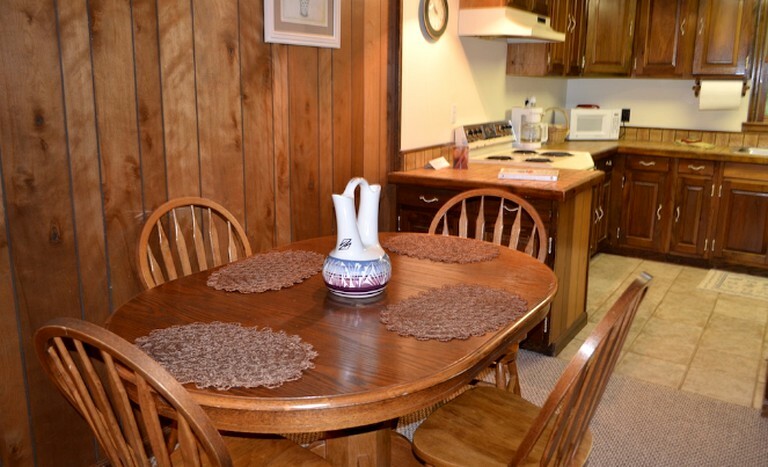 All cabins have electricity, heating and air conditioning, running water, and working bathrooms and kitchens. All cabins supply pots and pans, bed linens, shower linens, basic toiletries (shampoo, conditioner, and soap), DVD players, outdoor fire pits, and small charcoal grills for outdoor cooking. The nearest supermarket is The Food Lion on US Highway 29 in Lovingston—a half hour drive from the property. There are some small convenience stores in the area, the closest being about four miles away in Montebello should guests require anything for their rental. Chopped firewood is available for sale at the office for the campfires. 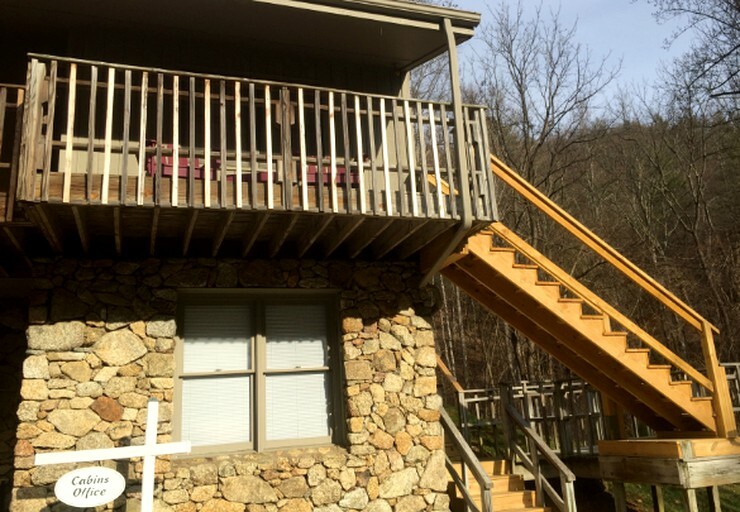 This property is located midway between Charlottesville and Lynchburg, Virginia, and is just six miles off the scenic Blue Ridge Parkway. Crabtree Falls is just a short distance away and is the largest vertical drop waterfall east of the Mississippi River—over 1,500 feet! 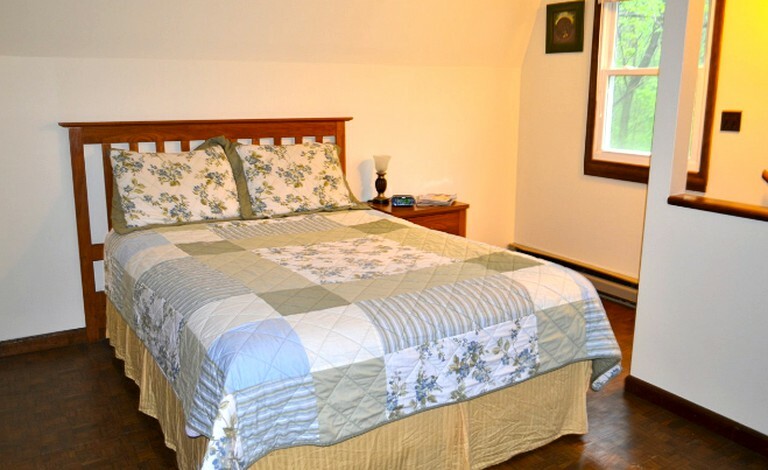 Surrounded by stunning mountains and vast forests, this property is ideal for nature lovers. Richmond is approximately a two-hour drive away, and Washington D.C. is three hours away, making this an ideal city escape. This stunning area of Virginia offers a vast array of activities for all types of glamper. With the forest on the doorstep of the property, glampers can explore the various hiking trails suitable for all abilities. Why not try mountain biking to take in the views with a difference? Hiking Crabtree Falls is also not to be missed. With various viewpoints and trails, this will provide glampers with ideal spots to practice their photography skills. Glampers can also kayak, canoe, white water raft, simply take it easy and fish around the various rivers and lakes. Further afield, glampers can explore vineyards on horseback, before sampling some of the regions delicious wine. Shopping, spa treatments, and golfing are also popular activities. In the winter, head to Wintergreen Ski Resort for some skiing, snowboarding, and other winter sports. There is a 50% refund up until two weeks prior to reservation. Within the two weeks, no refund is available. Please note, there is no cell phone reception on the mountain, and there are no phones in individual cabins. There is a phone available for use between the cabin "office" and the garage. Guests can rent DVDs from the main office on the property, and guests should note that, in most cases, there is no satellite or cable hook-up for the televisions.